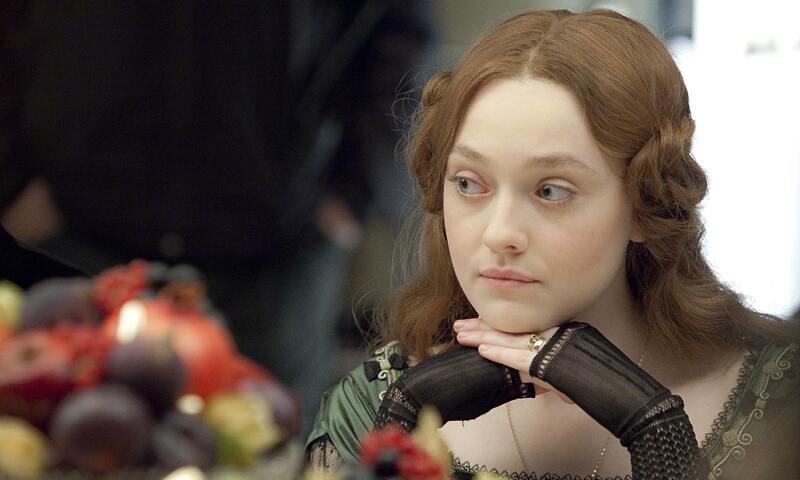 “Effie Gray” opens Friday at Sundance Cinemas. PG-13, 1:48, two and a half stars out of four. On a train ride, Effie Gray (Dakota Fanning) remarks to John Ruskin (Greg Wise) that sharing the train compartment together is the first time they’ve ever been truly alone together. They’re already married at this point. That would seem like a red flag. But such was the state of marriage too often in Victorian England, where women were rushed into marriage at a young age for the sake of status or financial stability, and only later got to find out whether their husbands made them happy or not. 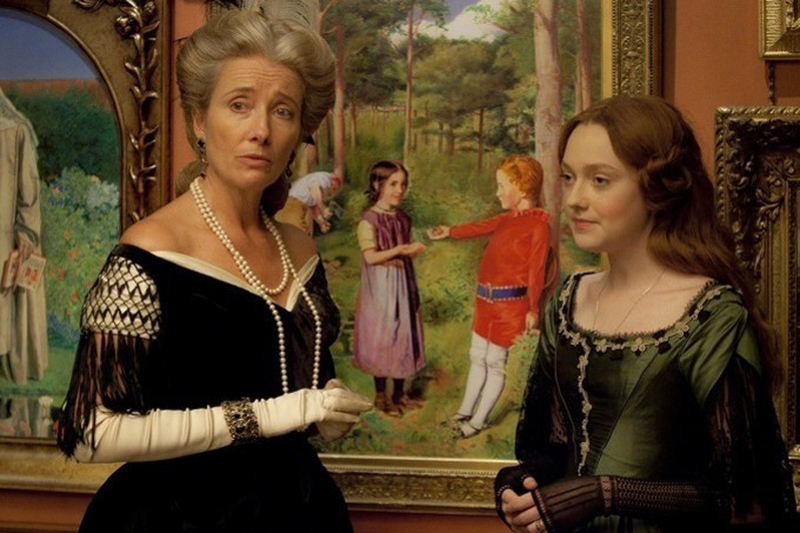 In the historical drama “Effie Gray,” written by Emma Thompson, the answer is decidedly no. Ruskin was an influential art critic in the early 1800s (he also appeared in Mike Leigh’s “Mr. Turner” as a much sillier character), and he had been wooing Effie since she was a poor Scottish girl of 12. At 21, she marries him, but finds on their wedding night that he seems repulsed by the notion of intimacy. Despite being an erudite scholar and well-respected man of letters, Ruskin was a stunted adolescent at heart, in middle age still living with his overbearing parents (Julie Walters and David Suchet) at home. He expects Effie to just move in to the family home and blend into the furniture, and when she chafes against the stultifying household, he treats her with indifference, disdain, and finally open loathing. Thompson effectively shows how living in a loveless marriage can rob a person of her identity, but the environment is so oppressive that the film becomes oppressive too. We see dreary scene after scene of Ruskin quietly denigrating his wife, and the faint glow in Fanning’s eyes growing a little dimmer each time. Effie’s only bright spots in life come from her conversations with her friend Lady Eastlake (Thompson), a lively woman who shows her what a true marriage of equals should be like. She also exchanges smoldering looks with a young artist (Tom Sturridge), but any romantic feelings they have must remain suppressed. Directed by Richard Laxton, “Effie Gray” is a handsome film, and Fanning is certainly engaging as Effie, suggesting her emotional imprisonment with those wide, haunting eyes. (Laxton cuts repeatedly to a painting of Ophelia drowning in the lake, and the physical resemblance is uncanny.) Wise (Thompson’s real-life longtime partner) makes a hateful villain, delivering the most cutting remarks in a polite murmur, using the social mores of his society to camouflage his emotional constipation. But the film is also listless, and airless, and we yearn for Effie’s emancipation largely so we can escape ourselves. Thompson also wrote the adaptation of Jane Austen’s “Sense and Sensibility” 20 years ago, and she aims “Effie Gray” to be sort of a dark, realistic mirror to Jane Austen’s tales of love in a status-obsessed society. But while Austen’s work has much to say about marriage across the ages, “Effie” feels like a drama bound to its specific era, and one we’re happy to leave behind there.